According to AI.com, former UFC interim heavyweight champ Shane Carwin has been named by a U.S. Attorney as one of 22 professional athletes who illegally obtained steroids through Applied Pharmacy Services, an Alabama-based pharmacy. J. Michael Bennett, the supervising pharmacist at Applied Pharmacy Services, was sentenced to four years in prison by a federal judge for his participation in a nationwide conspiracy to distribute anabolic steroids that were made in Mobile, Alabama. Bennett was convicted on steroid charges on February 8th, 2009, along with the owners of the pharmacy and clinic. Bennett’s co-defendants have not yet been sentenced, however it only appears to be a matter of time. According to the report, Applied Pharmacy Services shipped 762,388 dosages of steroids to 17 physicians and clinics from April 4th, 2004 through August 30th, 2006. During Friday’s court proceedings, Assistant U.S. Attorney Donna Dobbins named several athletes that illegally obtained performance-enhancing drugs with Bennett’s assistance, one of whom was Carwin. The 35-year-old part-time engineer began his MMA career in October 2005 and was perfect through his first 12 scraps. 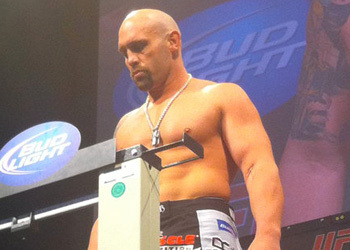 Carwin made his Octagon debut in May 2008 and nearly worked his way to the top of the mountain after capturing the interim title. Heavyweight king Brock Lesnar handed him his only pro blemish in his last outing at UFC 116. His manager, Jason Genet, told MMAFighting.com that Carwin, who is one of the sport’s classiest and fan-friendly athletes, plans to release an official statement regarding the situation shortly.